Le Gargantua | Are your Cooking Courses in English? Our courses are in English, unless you request a course in French for a party of 4. On our excursions we will meet French producers, but everything will be translated to you, so no worries, you do not need to speak or understand French to enjoy your time with us! "Are your cooking holidays all inclusive ?" "What will I actually learn?" "How much time will be spent cooking?" Of the many producers we visit on the seasonal french cooking course, Tucked away among the rolling hills of the Lot-et-Garonne, Gilbert has been crafting his wines for many years. As an organic wine producer he grows a selection of grapes including a very special variety unique to the area. His knowledge and experience in wine is what makes visiting Gilbert very special. 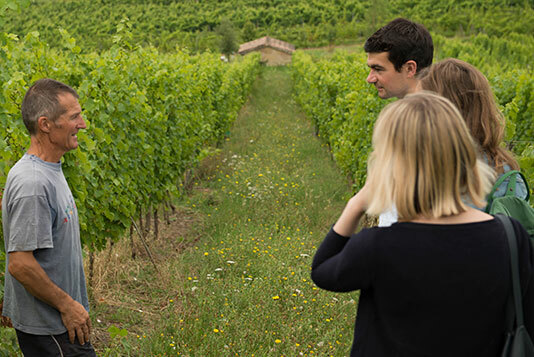 On our visit, he'll walk us through his grape vines explaining how he uses the natural environment to benefit the vines themselves and the blending methods used to achieve great tasting wine. You'll soon discover his wines have lots of character and flavour as we have a wine tasting over a picnic together.